He stays up late into the night - fearful to sleep because of those who watch in the dark. They watch from the sky. The watch from the streets. They watch with the cold, glassy stare of hidden cameras. His communications are not safe. They read all that goes in, and all that goes out. His entertainment is monitored 24 hours a day. They know what TV shows he sees and which web sites on the Internet he visits. But despite all they see and do - nothing can prevent the arrival of his favorite weekly e-mail newsletter of the strange and weird. Yes that's RIGHT! Conspiracy Journal is here once again to reveal all the deep, dark secrets that THEY don't want YOU to know! They are believed by many to be the agents of the “dark gods”! Their massive wings are known to cast a paralyzing shadow over the land. They exist alongside us in the “real world,” yet we know next to nothing about them. They appear to inhabit physical bodies, but they could be arriving from other dimensions through “window” areas or portals. What manner of creature is it that is called the Mothman? Is the winged interloper a harbinger of death? Or a cryptozoological entity who means us no harm? Some Native Americans believe that the Thunderbird was the creator of life on Earth. Do we owe our very existence to an elusive creature with an awe inspiring wing span and the power to call up all living things from the watery depths? Winged dragons are regarded in nearly every culture on Earth as benevolent entities, perhaps even mankind’s creators. But the Biblical/European view posits that dragons are evil. Join the lively moral discussion with writer and television personality Tim Swartz. Who among us hasn’t wished to spread their wings and fly? To cease to be earthbound and soar to the heavens? But perhaps, in real-world terms, a person with wings might not be such a pleasant, liberating thing. 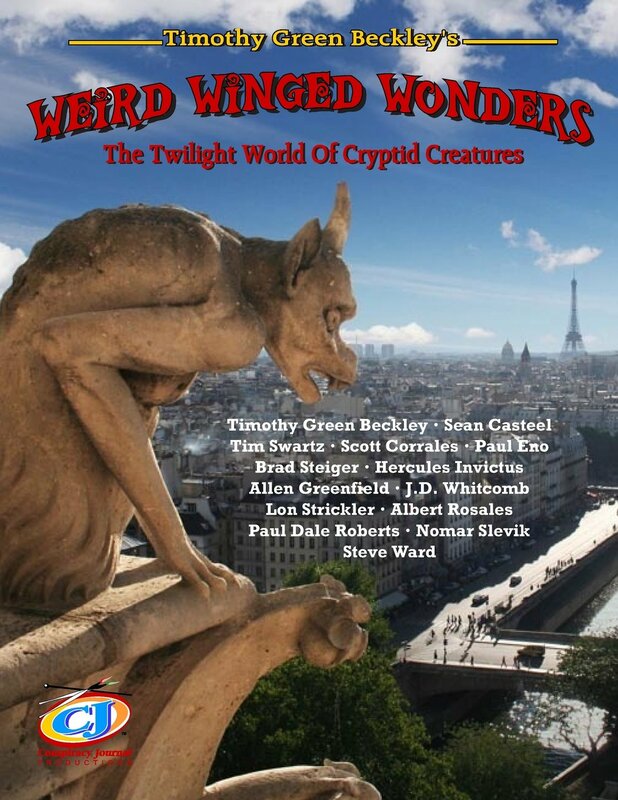 “Weird Winged Wonders: The Twilight World of Cryptid Creatures” from Timothy Green Beckley’s Global Communications/Inner Light publishing house, offers important new insights into flying humanoids. The reader should understand that we’re not dealing with the classic images of winged angels as portrayed by artists down through the centuries. The book is about something much stranger, more “alien” and frightening. A case in point would be the mysterious Mothman, popularized in recent years by the 2002 movie “The Mothman Prophecies,” which was based on a book of the same title by legendary paranormal researcher and author John Keel. The book and movie tell a fascinating story of the appearance of the winged creature which is most frequently described as a human-looking figure with wings and two giant red eyes. 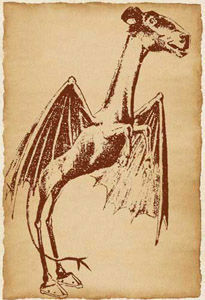 The creature is reported as being six to eight feet tall; his wings are bat-like and sometimes folded against his back. After more than a year of scattered sightings by locals in the area around Point Pleasant, West Virginia that began in autumn of 1966, a tragic accident occurred. The Silver Bridge, vital to commuters in the area, collapsed during rush hour traffic in December 1967, killing dozens of people. Residents soon began to wonder if there was a connection between the Mothman’s many appearances and the massive bridge disaster. Did the winged man consciously function as a harbinger of death? A photo of Mothman perched atop the Silver Bridge before its collapse. In the years since the frightening events in Point Pleasant, the Mothman has continued his sporadic appearances around the world. But in 2017, in Chicago, a new and massive wave of Mothman sightings began that has as yet shown no signs abating. Strickler admits up front that he is still a long way from answering the lingering questions he shares with the people who reported their experiences. Strickler quite naturally connected the dots between the Point Pleasant and Chicago sightings. Interestingly, Strickler says he somewhat regrets making that speculative statement before all the facts were in. While the quote may one day prove to be true, he now feels it is better to let the data and evidence determine what the winged humanoids really are. 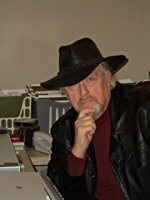 The renowned journalist of the paranormal, Brad Steiger, is the prolific author of numerous books, such as “Real Visitors, Voices From Beyond and Parallel Dimensions,” as well as the upcoming “Haunted: Malevolent Ghosts, Night Terrors and Threatening Phantoms,” which is due out in September 2018 and is available now for pre-order on Amazon.com. Steiger contributes a pair of chapters to “Weird Winged Wonders,” including one that recounts some of the Thunderbird legends that are a part of Native American culture. “The Chippewa tribe has a tradition,” Steiger writes, “that, in the time-before-time-began, there existed a bird of supreme majesty that descended to Earth, which was then only a vast expanse of water. The bird’s eyes were fire; its glance was lightning; and the motion of its wings rippled the air with thunder. When its talons touched the water, the Earth Mother arose from the deep waters, bringing with her to the surface all manner of animals. Steiger writes further that for hundreds of years thunderbirds were seen by not only Native Americans but also frontiersmen and settlers. Eventually newspapers began to take these accounts seriously enough to report them. One example offered by Steiger was from a Bedford, Iowa newspaper in 1887. A man named Lee Corder encountered a flying serpent writhing and twisting, with protruding eyes and a forked tongue. Great scales, which glistened in the sunlight, covered its huge body, which appeared to be flat and nearly a foot in width. The newspaper account described Corder as a man of “unimpeachable veracity,” and goes on to say that he, and those with him, watched the flying serpent with “awe and astonishment” as the creature landed in a cornfield a few rods distant with a dull thud. The witnesses professed to be so frightened that none of them wished to block its path. It was permitted to pass on its way “unmolested,” and no one attempted to halt its wish to return to the sky. Inspirational artist Carol Ann Rodriguez depicts a fire breathing dragon as seen throughout history — right up until today! Another author in Timothy Green Beckley’s impressive stable of writers is Tim Swartz, who has authored numerous books for Beckley as well as being featured on the History Channel’s “Ancient Aliens” series. For “Weird Winged Wonders,” Swartz has contributed a chapter on Winged Dragons and Other Airborne Oddities. Dragon allegedly filmed flying over China. Swartz explains that it’s not clear when or where dragons first emerged. Some scholars speculate that the discovery of fossilized dinosaur bones may have been the genesis of ancient dragon lore. What is known is that practically every society had them in their mythologies. For much of human history, dragons were thought of as being real as well as either useful and protective or harmful and dangerous. The King James Version of the Old Testament contains at least twenty-two citations for dragons, Swartz informs us. The majority of Old Testament references to dragons are derived from the Hebrew word ‘tanniym’ or ‘tannim.’ This word can mean a jackal, serpent, sea serpent or even a land or sea monster. “I am a brother to dragons, and a companion to owls,” reads Job 30:29. The Biblical references to winged reptiles depict primarily negative creatures, but there have been more positive interpretations. An ancient apocryphal document called “The Apocalypse of Abraham,” found only in the Slavonic language and dated to the First Century C.E., clearly depicts the serpent which tempted Eve as a winged dragon. Swartz then discusses the idea that flying serpents or dragons are found in the cultures of people throughout history and are usually considered to be benevolent creatures and in some cases are the ancestors of man. Timothy Green Beckley has again assembled a wealth of writers, this time to cover various aspects of winged wonders down through history and into our present day. Beckley writes the book’s introductory chapter as well as pieces on the Jersey Devil and winged cats. He also presents the work of several contributors who examine the subject of weird winged wonders from many different angles and present dozens of case histories of winged phenomena, both good and evil. This article would not be complete without listing them all. They are the aforementioned Tim Swartz, Lon Strickler, Brad Steiger and Hercules Invictus. Also included are Jonathan Whitcomb, Allen Greenfield, Steve Ward, Nomar Slevik, Scott Corrales, Albert Rosales, Paul Dale Roberts and Paul Eno. In the interest of full disclosure, I myself have written a chapter on the Chicago Mothman sightings and the work of Lon Strickler that is included in the book. “Weird Winged Wonders” is a welcome addition to the literature of the paranormal. The subject of winged creatures in ancient myth and modern folklore is fascinating but often overlooked, and Beckley’s unique ability to carve out a piece of supernatural territory that deserves wider coverage is again on display here. You should avail yourself of the opportunity to educate yourself on the legends of gods and demons who take flight on the wings of mystery. DRAGONS AND UNICORNS: FACT? FICTION? 358) US (Oregon).Female; 2000s; 21-30; inside a private house; on my own; 9 am-12 pm; less than a minute; friendly, mischievous, ‘not sure, they seemed to want to be near me’; occasional supernatural experiences; no special state reported; a sense that the experience was a display put on specially for you, unusually vivid memories of the experience. It was around 10 or 11 am in the early summer of 2002, and I was in the bathroom, just starting my bath. It was so warm and bright that I had the small window open, and the breeze was coming right in from the backyard. (There was never a screen on that window because it was a little high up, and too small for a person). I shrugged off my robe, and sat down on the tub edge, waiting for the tub to fill. Quite suddenly, a flickering cloud of little lights came right in through the window and, as though attracted to me, flew close, almost touching, around my head and shoulders. I was so shocked that my brain just froze! There was a tickle in my nose, and something in my understanding just clicked. I said out loud, and I mean, LOUD, (though as a twenty-nine-year-old woman such a thing had never occurred to me as being within the realms of possibility or even reality) ‘Hey! Faeries! Go away!’ And I tossed my head and flicked my wrist. The cloud of little lights zoomed off a little bit away from me, then gathered close together, for just a second, and I almost heard a sound, but it wasn’t quite a sound, really, more of an impression that there was communication between them that I could very nearly hear, like a buzz or a high frequency whine or bells shimmering like when they bless the Host in Mass – and then they flew as one, right out the window again! I was so surprised that I jumped up, naked as a jaybird, shut the window, and yelled out to my husband to come to the bathroom. My knees were too wobbly to support me just then. Whew! Never thought I’d get a chance to tell that to someone who didn’t think I was NUTS!!! To dig a bit deeper into fairylore beyond the accounts in the Census, be sure to get the companion book featuring essays from Simon Young and other folklorists and historians, Magical Folk: British and Irish Fairies, 500 AD to the Present, available now from Amazon US and Amazon UK (see John Reppion’s review of the book here on the Grail). And you can head over to the Facebook page for the Fairy Investigation Society to find out more about research into fairy sightings, both ancient and modern. Is Some UFO Debris Dangerous To Touch? The New York Times recently exposed the “Advanced Aerospace Threat Identification Program” as a secret, multimillion dollar Pentagon UFO program which ran from 2009-2012. Included in the New York Times investigation was a very interesting claim: that the program had studied people who said they had experienced “physical effects” from their encounters with UFO material. The newspaper also stated that contracts were let by the US Government to private contractor Bigelow Aerospace to “specially modify” facilities to store UFO alloys recovered by US forces. “Physical effects” is a very interesting term to describe what some of the UFO material is doing to individuals. It means to affect a change in the functioning of the body. Frequently such effects can mean symptoms of nausea and disorientation, rash or eruptions, vision problems, or sleep and mood disorders. Such debris are “out of place artifacts” that are not yet meant to be. They are things that are not from our past or present nor are they from our planet. Exposure to these items represents the premature arrival of the future and could be disorienting to some people. Can some of these metals make you “metally” ill? The newspaper reported that Bigelow Aerospace was awarded a contract to “specially modify” facilities in Las Vegas to house UFO debris or crash material. One of the possible reasons for the government contracting Bigelow to “modify” the buildings is to help to shield those who may be sensitive to interaction with such material while working with it. And this is not the first time that such aversion or repulsion to contact with such metalloids has been reported. At the Roswell UFO crash in 1947, three military men reported that handling the debris gave them “issues” including obsessive washing. Incredibly, even animals were repelled by the Roswell UFO metalloids. Wallace was a Sergeant at Roswell Army Air Field in 1947. His widow spoke with researchers some years ago. She indicated that her husband had told her that he was ordered with others out to the debris field north of Roswell where a UFO had crash landed. Wallace was made to comb through the field and pick up “anything that didn’t move.” When he returned home that evening, his widow recalls that her husband said he felt “dirty.” He simply could not feel that he could get clean. She said that he scrubbed himself raw with lye soap for 10 days, exclaiming to her that he should never have touched the weird, sky-fallen metals. According to his namesake son John, Tiffany was a Tech Sgt. stationed at Wright Field during the summer in 1947 when a saucer crashed to earth. His father told him that he had been sent to Fort Worth, Texas Army Air Field to pick up strange metallic wreckage and a large cylindrical container that had reminded him of a giant thermos bottle. Tiffany described the metal as being lightweight and tough. It had a smooth, glass-like finish. It could not be marked or dented. Tiffany told him that he did not like handling the material at all. In fact, Tiffany indicates, the material “was so foreign to him” that he felt as though it was impossible to get fully clean after touching the alloy. Authors Don Schmitt and Kevin Randle, in a Roswell update newsletter that they issued in 1994, mention a Tech Sergeant Charles Randall. Randall’s daughter Terrie of Portland, OR stated that in 1953 her father told her about his involvement at the UFO crash incident at Roswell. He told her that he was ordered with others to retrieve and recover unusual metal-like material in a field north of Roswell in 1947. He handled some of the material, as did some of his friends. He did not like touching it for, as she described it “fear of its effects” on him and his comrades. Randall died in 1976. Investigator Tom Carey indicates that the debris field at Roswell had affected the ranch animals in a very strange way. The son of ranch manager Mack Brazel, Bill Brazel Jr., and Mack’s granddaughter Fawn Fritz, explained that the sheep would not cross or enter the field where the UFO debris had fallen and subsequently been retrieved by the military. In fact, according to Brazel’s relatives, the sheep refused to go anywhere near the field where the metal had fallen for a full two years after the crash! Mack had to divert the sheep a mile back and forth to get to their regular watering hole. Had the UFO metal somehow “imprinted” on and tainted the earth itself, making animals (who are often known to be very sensitive to subtle emanations or frequencies) refuse to go near? Some people are allergic to certain metals. For instance, contact dermatitis (redness and irritation) can occur on the skin of sensitive individuals who wear nickel or copper rings or bracelets. And exposure to rare earth metals like arsenic and cadmium can kill you. Metals can exert profound effects. Metal like silver can conduct electricity, and some metals, such as cobalt and iron, are highly magnetic. If terrestrial metals have these abilities to perform and to affect people, imagine what alloys that are not made by man do to the men who behold them? Perhaps the debris generated or resonated a field or frequency of which we are not yet familiar. And just as UFOs themselves have been known to leave physical traces, turning off and on lights and cars, etc., it is likely that their debris – their materials of construction – may also leave their marks. Recent advances in science and technology have allowed alien hunters to scour the far reaches of space for any signs of alien life. Although we have yet to identify any evidence of extraterrestrial life, either microbial or intelligent, some scientists believe that there may be a potential threat to humanity from aliens. In a new research paper, astrophysicists Michael Hippke and John Learned argue that telescopes designed to search for alien signals, could pick hazardous messages from intelligent extraterrestrials. According to the researchers, aliens could launch a virus or cyberattacks to shut down our computer systems. The researchers also suggested that aliens could "gift" us with an artificial intelligence (AI) system that may trick humans into developing self-replicating nanobots and eventually deploy them to wreak havoc on our planet. The researchers argue that it would be cheaper for aliens to "send a malicious message to eradicate humans compared to sending battleships". In one scenario, the researchers argued that a message from aliens could be a panic-inducing statement like "We will make your sun go supernova tomorrow". According to the researchers, if such a threatening message is received in just one location, it may be possible to contain and even destroy it. "If it is received repeatedly, perhaps even by amateurs, containment is impossible," the researchers wrote in a paper available online on arXiv. In another scenario, the scientists argue that humans could be tricked into begetting their own demise by aliens offering the "gift" of knowledge. For instance, aliens could transmit a message that reads: "We are friends. The galactic library is attached. It is in the form of an artificial intelligence (AI) which quickly learns your language and will answer your questions. You may execute the code following these instructions..."
In this scenario, the researchers suggest that even if the utmost care is taken to isolate the AI – by flying the system to the moon and wiring it up with explosives so it can be shut down immediately in the event of a threat, the AI would still likely have some human contact. "Even in a military-style, adamant experiment, there will still be humans involved who go home after examination work with their own feelings. Even if everything is officially secret, whistle-blowers might get some news out to the public," the researchers wrote. "Quickly, there could be a community on Earth in favor of letting it out for religious, philosophical etc. reasons. "If the AI promises to cure cancer, or offers a message of salvation, a cult could form. Maybe (or maybe not) a majority of the population would be in favor of releasing the AI. Should, or even could, a democratic government work against the majority of its people? Dictatorships are unstable and eventually overthrown; the AI will be eventually released. Then, the worst possible result would be human extinction or some other unrecoverable global catastrophe." The scientists warn that in the event we receive any complex messages from extraterrestrial life forms, they should be destroyed to avoid a potential threat. But is it even likely that we would receive messages from an alien civilisation in a language that we understand? "In movies, extraterrestrials often communicate with us in colloquial English. But a real message from space is likely to be no more understandable than a digital TV signal would be to Guglielmo Marconi," Seth Shostak, an astronomer at the SETI Institute, wrote in an op-ed in NBC News. "An alien transmission is unlikely to be a Trojan horse — but it would at least tell us that there's someone outside the gates." It was a hot night so a man decided to take a walk along the beach. Soon after setting out, he felt a soft crunch under his foot. He stopped to inspect the soles of his shoes in the moonlight, and scraped off the remains of the unfortunate creature he had squashed. Unconcerned, he continued his stroll, unaware that the footprint had immortalized the end of that tiny life. After all, what's so strange about stepping on a trilobite? Approximately 320 million years ago, a species of small lobed creatures began to populate Earth's seas. These relatives of sea arachnids—similar to lobsters and crabs—once flourished but became completely extinct 280 million years ago. We are talking, of course, about the trilobite. The human being, as it is currently accepted by the majority of scientists, appeared as a species no more than 2 or 3 million years ago. And the history of man such as he is known today does not exceed 10,000 years. With these dates in mind, we can conclude that the story of the human stepping on a trilobite belongs to the category of science fiction. A human being could never have squashed a creature that became extinct millions of years ago, and even less so a person with shoes—an unequivocal indication of civilization. This is evidence which defies history—an impossible fossil. In June of 1968, amateur fossil collector William J. Meister found a rock 2 inches thick in Antelope Spring, Utah. With a blow of his hammer, he exposed the fossil of a human footprint. But this footprint had a special feature—a squashed trilobite. It wasn't long before the news spread across the world, and several investigators made their way to Antelope Spring, finding more marks made by modern-style footwear in a geological stratum corresponding to extremely remote ages. What strange joke is seemingly being played on history? In 1852 a giant rock mass in Dorchester, Massachusetts, was dynamited. After the explosion, workers found a curious metallic artifact among the debris, which was broken in two. Upon joining the two pieces together, they revealed a vessel in the shape of a bell with a base of 6.5 inches and height of 4.5 inches. Later they discovered that the vessel was made from a silver alloy. Curiously, this artifact, seemingly constructed with a high level of technology, appears to have been trapped in the rock while it was forming several millions years ago—when humans did not even exist. Discoveries of this kind are not few. In fact, because of their ability to call in to question modern understandings of humankind's origins, archeological sites have at times hidden various problematic objects. Eight years before the discovery of the Dorchester vase, a perfect iron nail was found in a 24-inch slab of rock in a quarry in Kingoodie, Scotland. The point of this nail was sticking out of the rock, while an inch of it, including the head, was sealed inside. It is estimated that such a rock would have formed roughly 60 million years ago. In the 1880s, a Colorado rancher extracted pieces of carbon from a mineral vein 300 feet below the surface. Later at his house, as he was breaking up the extracted pieces, he found a strange-looking iron thimble. News of the discovery known as the "Thimble of Eve" spread quickly, but due to its state of corrosion and people's over-handling, it disintegrated. It is known that thimbles have been used by humans as far back as thousands of years ago. However, a curious detail in this case is that the carbon in which the thimble was found formed 70 million years ago, between the Cretaceous and Tertiary eras. According to modern understanding, the ancestors of human beings at this time were not even monkeys, but a different kind of small mammal, with protruding eyes, swinging between tree branches. The "Cube of Salzburg" is another challenge to history. It was revealed to the public when in 1885 an Austrian iron smelter broke apart pieces of carbon and uncovered a cube-shaped iron artifact. "The edges of this strange object were already perfectly straight and defined; four of the sides were planes, while the two remaining sides, situated in front of each other, were convex. Halfway up was a deep slot," wrote René Noorbergen, a specialist in these types of cases. Chemical analysis later determined that the object did not contain any chrome, nickel, or cobalt, but instead was composed of a kind of forged iron. This composition seemed to rule out the hypothesis that the "cube" was a meteorite, as some had suggested. Another archeological treasure hidden in a carbon deposit was found in 1891 by S.W. Culp, a woman from Illinois. While she was extracting the black material, she accidentally broke a fragment, and a very thin gold chain was knocked loose. It had been lodged inside a bow-shaped cavity in the carbon. Another case, published in 1831 by the American Journal of Science, deals with a block of marble extracted from a depth of about 60 feet, which was later cut into pieces. The marble, believed to have formed millions of years ago, revealed precise cuts 2 inches by 0.5 inch—the shapes of the very similar modern letters "u" and "i." The regularity of the symbols gave the impression of having been engraved by human hands. A similar case was brought to light in 2002 in China's Guizhou Province, where a broken rock was found to have, at first glance, perfect Chinese characters of inexplicable origin, considering that the rock dated back to 200 million years ago! This relic is known as "The Stone of Hidden Words." In 1976, a spoon that was first unearthed in 1937 inside a chunk of Pennsylvania soft coal was brought to public attention. To rule out that such findings could be interpreted as a random occurrence, consider the 1967 discovery inside a Colorado silver mine: human bones alongside a 10-inch copper-pointed arrow. According to general estimates, the mineral deposit in which these were discovered is millions of years older than the human race. While genetics and biology present us with new studies each day intending to validate the common origin of all species, new fossils continue to appear—more signs of a highly advanced distant past. Over time, these findings contribute to an understanding that human origins are far more remote than what is widely believed. Perhaps the most controversial fossil in recent years was the one discovered by a geologist from the University of Jadaypur in Calcutta, India. A 1,100-million-year-old, reddish colored rock found in Madhya Pradesh, Chorhat, astonished scientists. It presents zigzag marks similar to those made by a worm. The oldest known fossils of this kind are from Namibia and China, and the marks are understood to be from multicellular organisms, which made their appearance in the course of evolution approximately 600 million years ago. If the finding in India is properly interpreted, it would call for a serious reconsideration of the basis of evolution, giving a giant jump (400 or 500 million years) between this fossil and those found in Namibia and China. "If you see centimeter-scale organisms and then don't see them for 400 million years, you have a lot to explain," remarks Harvard University paleontologist Andrew Knoll. After new marks were found in similar rocks, many incredulous scientists were forced to analyze the age of the rocks again. But these specimens (zirconium crystals) continued to point to the impossible, making the issue "even more exciting and more improbable," according to paleontologist Adolph Seilacher from Yale University. Seilacher believes that, according to what is commonly accepted, it is impossible for these fossilized traces to be from animals. However, he adds: "At the same time, I must accept the evidence. I have not found, nor heard from another person, another explanation. Is there any non-biological explanation for these marks?" The study appears in the October 2, 1998 issue of Science. In fact, there exist many fossils that challenge our modern understanding of history. An impression of a perfect human hand (with fingernail marks) was discovered in 110-million-year-old limestone in Glen Rose, Texas; a 100-million year-old petrified finger (fossil identified as DM93-083), which had its bone structure revealed through radiography, was found on Axel Heiberg Island in Canada; there is the well-known discovery of giant human footprints beside those of a dinosaur in Rìo Paluxy, Texas; and there are many more. The apparent soundness of our current theories is shaken each time an "impossible fossil" comes to light. Terrified villagers are forcing their husbands to wear women's clothing and makeup to bed in fear an evil widow ghost will kill them. Other residents of the remote hamlet in Nakhon Phanom, northeast Thailand, are hanging scarecrows with huge penises outside their homes. The village of 90 people flew into a panic after five fit and healthy young men died suddenly in their sleep in recent weeks. They believed a widow's ghost was terrorising the village by seducing men in their sleep and taking their spirits to the afterlife for her to have her way with them. Deeply superstitious locals in response put scarecrows wearing red clothes with giant 80cm erect penises with a painted red tip outside their homes. Some also have labels on them saying 'there is no man here' and others made their husbands wear women's clothes and makeup to bed. The makeshift solution appeared to have worked as not a single man died since the scarecrows were made about a week ago. Relieved pensioner Nong Ayu, 68, said everyone was afraid of the widow ghost and there were rumours men in neighbouring villages had also died. 'Nobody knows why and the village elders are afraid that the young teenagers will die next. There could be no more men left here,' she said. The five deaths of the otherwise healthy men started earlier this month. They died in their sleep shortly after having a bath and going to bed. Villagers believed large penises were a symbol of masculinity and strength which defended against the ghost widow - drawing her to the scarecrows instead of their men. Some wives even made their husbands wear makeup and women's clothes when they went to bed, in the hope that the ghost widow would mistake them for a female and stay away. 'The deaths first started with two men in their 40s who were physically strong. They didn't have any diseases,' Piyatida Wai, 36, said. 'They had been bathing then went to bed like normal. Their relatives found them dead in the morning. 'Now my son is afraid that his father will die. We have put the scarecrows up outside the homes. They also have a label on them which says "there is no man here". Other residents said the village was always a very normal place to live but the recent deaths shook them. Johnny, 53, who has a Thai mother and American father, said: 'I believe that the ghost of the widow is causing healthy men to die. There have been five deaths already here. 'My wife and child are afraid that I could die and they wanted the scarecrow to protect me. Every house has done the same.